World renowned vocal consultant Robin De Haas authored the highly acclaimed La Voie de la Voix, published by Les Editions Favre, the largest French-language publisher in Switzerland. This book is now brought to the English speaking world by Elizabeth Prescott, De Haas' Los Angeles representative. Native of Switzerland, Robin De Haas received his Diplôme d'Enseignement du Chant from the prestigious Haute Ecole de Musique de Lausanne and studied with prominent instructors throughout Europe and the U.S. Driven to question, research and analyze existing models of methodology for both classical and contemporary styles of singing, De Haas began a long and fruitful collaboration with Lynn Martin, professor of anatomy at New York University, and instructor of both Breathing Coordination and Functional Anatomy. 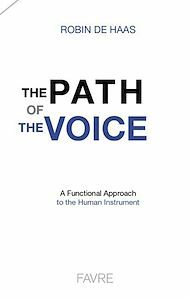 He later designed the certification program for the practice combining these two elements, further refining them through the addition of precise elements of vocal pedagogy. As of this publication, fifty practitioners from seven countries have been meticulously trained by Martin and De Haas. Robin De Haas has presented for the Manhattan School of Music, the Swiss Pulmonary League, and in 2017 for the French-equivalent national chapter of NATS (National Association of Teachers of Singing) in Paris, France. Robin De Haas works in collaboration with several members of the medical community for the application of his work in the field of pathologies. "La Voie de la Voix' is often described as "revolutionary' and is currently in its second printing in French in addition to this English-language publication.